Why are Christians leaving Bethlehem in droves? Pope Francis will make a highly symbolic trip to the Holy Land, meeting his Orthodox counterpart, having talks with the Israeli prime minister as well as the Palestinian president. He will also say mass in Manger Square in Bethlehem, as the birth place of Jesus, the most significant place for Christians around the world. In the first of this two-part documentary, John Laurenson travels to Bethlehem, the birthplace of Christ, to explore why this once overwhelmingly Christian place is losing Christians in droves. It seems like the place where it all began looks more like a place where it’s al coming to an end. The Christians now represent less than 15% of the population. John explores the reasons for the exodus. In the fields where the Angel Gabriel is said to have told the shepherds about the birth of Christ, a Christian returnee picks wild peas and wild barley and tells John about the land, her family in LA and how a foraging expedition with a 10 year-old nephew ended with Israeli tear-gas. The spokesman for the Israeli PM says Christians are leaving because of the Muslims, but they say there is little tension between the two faiths there. 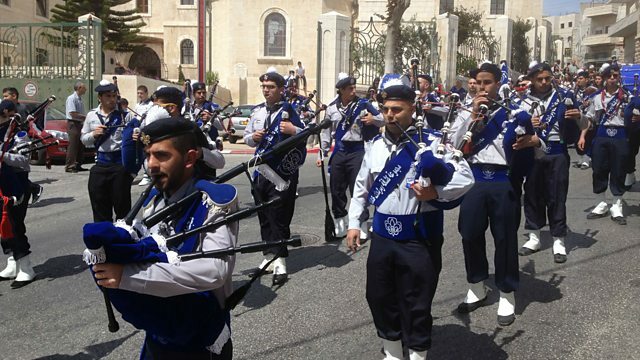 John also hears from Bethlehem’s bagpipers as they prepare to honour a tradition that goes back to the British mandate – to parade with pipes and drums in Jerusalem on Palm Sunday.